This reissue from Speakers Corner was mastered from the original master tapes at Sterling Sound by the great Ryan K. Smith and if you didn't know that going in you'd figure it out quickly. The original is warmer and softer and clearly rolled off on top and lacking in true detail, which might make it more "pleasant" for some, but this reissue in my opinion is so far superior it's not even up for debate. There's so much more information here, both musical and spatial. The vocals are far superior sounding as is Armstrong's trumpet. If you play it too loud, yes it will get nasty but played at the appropriate level, the clarity, transparency, spatiality and everything we love about listening to recorded music will be evident. Only the final track's "pop white bread" chorus mars, jars and dates the production but it's quickly over leaving a pleasing residue of musical and sonic time travel. A "must have" for Ella and Louis fans. The dream of creating an American opera such as Scott Joplin’s "Treemonisha", written in 1911, inspired George Gershwin a good twenty years later to amazing compositional feats. 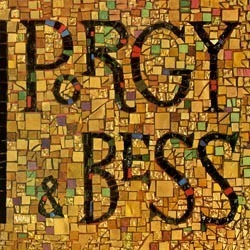 While Gershwin had brought his musical and musical comedies with great éclat to Broadway, he wanted his through-composed stage work "Porgy And Bess" to be regarded as a legitimate opera. No matter whether one regards this exceptional work as »American folk opera« (The New York Times) or as a veristic portrayal of African-American life, central to the work is the expressionistic orchestral music that includes (work) songs, spirituals and elements of jazz, and the cast of singers, which, at the insistence of Gershwin, featured African-American singers. This stipulation will certainly have suited Verve boss Norman Granz who engaged not only a fresh and lively big band but also a classical string orchestra to support his successful duo of Ella and Louis. Thanks to this superb line-up, the catchy song "I Got Plenty O’ Nuttin’" rolls along sleekly with swing and drive, while "Summertime" and "Bess, You Is My Woman Now" wafts away to the sound of heavenly violins. Listening to this music, you couldn’t care less about the genre or category, just as long as these two genial musicians perform wonderfully arranged material from the American Song Book. The incomparable nasal twang of Armstrong’s solo trumpet seeks out unerringly jazz elements where you would least expect them. 7. Bess, Oh Where Is My Bess?